There is no systematic effort being conducted by the government to clear landmines in the country, according to a report recently released by the International Campaign to Ban Landmines (ICBL). Two Reuters journalists jailed while reporting on the Rohingya crisis in Myanmar are set to appeal the decision on Monday (Dec 24), after spending more than a year behind bars despite global outcry over their convictions. The Myanmar Military (or Tatmadaw) on Friday declared a unilateral four-month ceasefire effective in active conflict areas in north and northeast Myanmar. The first truce ever initiated by the military, the unprecedented move has been hailed as a constructive gesture. A government-sponsored study warned against restarting the highly controversial Myitsone dam and recommended alternatives to develop the country’s hydropower sector. The body of a missing Myanmar policeman was found on the country’s troubled border with Bangladesh, state media and officials said on Sunday after a clash with unknown gunmen last week. The Ministry of Planning and Budget announced an increase in the monthly pension for retired government employees starting in April next year. The Arakan Army (AA) sent warning letters, each accompanied by a bullet round and the official AA stamp, warning the recipients against disturbing those who are “implementing the way of Rakhita,” a phrase which was coined by the political wing of the AA, the United League for Arakan. Clashes between the Tatmadaw (military) and Arakan Army (AA) have forced more than 500 people to flee their homes in northern Rakhine State. Myanmar’s rich biodiversity continues to be damaged by illegal trade and the killing of elephants and other wild animals. The military’s representatives in Myanmar’s Union Parliament have urged the national legislature to respond to what they described as misinformation and propaganda about Myanmar over the Rakhine crisis. The Myanmar martial arts sensation will defend his ONE Middleweight World Championship against Japan’s Ken Hasegawa in a highly anticipated rematch on March 31, 2019. Can LNG fuel Myanmar’s energy demand? Ever since Myanmar undertook a series of political, economic and administrative reforms in 2011, the country’s economy has steadily improved. The Rohingya crisis receives most of the global media’s attention currently due to the scale and magnitude of the humanitarian crisis that is unfolding there and rightly so. 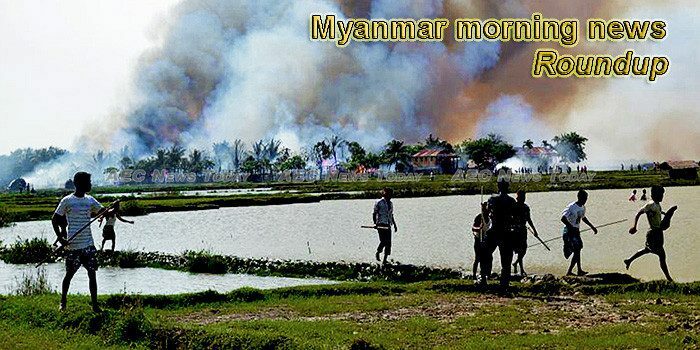 However, there is another deadly ongoing conflict in Myanmar. The military-controlled General Administration Department (GAD) will soon be transferred to the Ministry of the Office of the Union Government, President’s Office spokesperson U Zaw Htay said Friday.